Apply today and join the first 2019/2020 Intake. 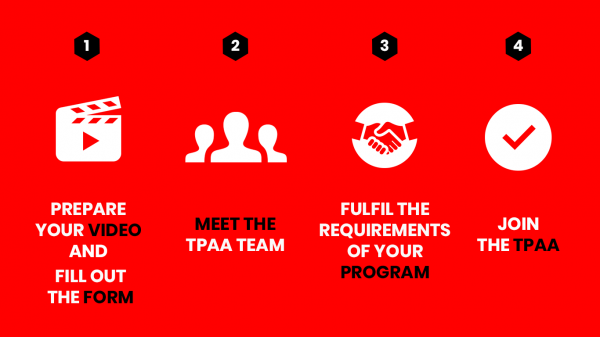 You have any questions before applying to the TPAA? Contact directly our recruiting team if you want to receive any additional information. Ready to apply? Follow the four steps of our application process! NOW STEP 1 : Prepare your video and fill out the form! All candidates to the Tony Parker Adéquat Academy must submit a video explaining their involvement in their passion. This video will be an essential element of the Tony Parker Adéquat Academy application, please note that the technical quality is not a criterion of selection. As soon as your video is ready, you can fill out the online application form below! The candidates selected at the end of the first step will be invited to meet the team of the Tony Parker Adéquat Academy for an interview in Lyon or by Skype. With the support of the Tony Parker Adéquat Academy team, you will have to follow the admission procedures specific to each program. The list of required documents is available here. Once accepted in the chosen program, candidates will be admitted to the Tony Parker Adéquat Academy subject to compliance with the administrative procedures. By ticking this box you consent to the retention of your personal data by the Tony Parker Adéquat Academy. These data will not be transmitted to others, their purpose being to be able to contact you and receive additional information about the Tony Parker Adéquat Academy. These data will be stored digitally for 12 months before being completely deleted. You can use your right to consultation or deletion of the data by contacting the Tony Parker Adéquat Academy via the mail contact@tpadequatacademy.com.